When the iPhone 6s launched, Apple said "Hey Siri" functionality was made possible by the M9 chip, which is integrated into the A9 processor. Promotional materials for the iPad Pro suggest that the M9 coprocessor is also integrated into the tablet's beefed-up A9X CPU. Despite this, however, there is no support for "Hey Siri" to be actively listening in the background while the iPad Pro is unplugged. Digging into the iOS 9 Settings app, the iPad Pro indicates that users can use "Hey Siri" only when the device is connected to power. This same capability can be found on past iPhones and iPads as well. The absence of always-on "Hey Siri" support in the iPad Pro means it remains exclusive to the iPhone 6s and iPhone 6s Plus. "Hey Siri" can also be used with the Apple Watch, but users must first raise their wrist to activate the screen before speaking. The M9 chip also gives the iPhone 6s the ability to measure a user's walking or running pace when they exercise without the need for GPS —something that obviously serves no purpose in a large device like the 12.9-inch iPad Pro. 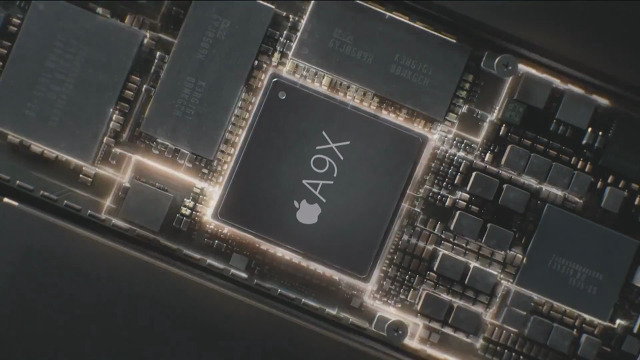 Because it's integrated into the A9 series of processors, Apple says the M9 is more efficient than its predecessors. Apple's M-series chips handle all motion tracking capabilities for its iOS-based devices, via integrated gyroscopes and accelerometers.